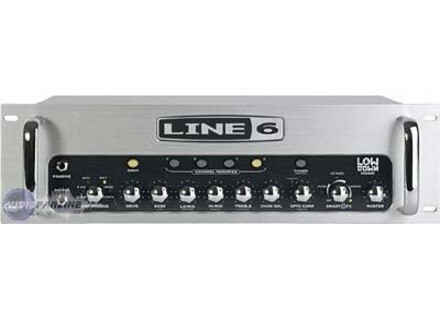 LowDown HD750, Bass Guitar Amp Head from Line 6 in the LowDown series. Line 6 has announced the LowDown LD400 Pro 2x10 combo as well as the HD400 and HD750 heads, the newest additions to the LowDown series of bass amplifiers. Aimed at providing a "bigger, louder" bass sound, the LowDown LD400 Pro, HD400 and HD750 include the full feature set of the original LowDown family: an extended palette of bass tones from five distinct amp models inspired by the sounds of legendary amplifiers and classic setups. Each LowDown features a studio-quality compressor, synth bass and three Smart Control FX including Chorus, Envelope Filter and Octaver. Other features include an integrated chromatic tuner and four user-programmable memories (expanding to 36 with a Line 6 FBV™ pedal). And, of course, each LowDown amp features a balanced XLR direct out for live performance or direct recording. The LowDown HD750 head delivers 750 watts at 4 ohms, the LowDown HD400 dead produces 400 watts at 4 ohms and the LowDown LD400 Pro combo pushes 400 watts through two 10" speakers and a compression driver horn. [Musikmesse] MTD Kingston Z "X" Michael Tobias Design presents the Kingston Z "X" bass, a limited edition of the brand's classic "Z" bass series. [Musikmesse] Sandberg California JJ-Umbo Sandberg introduces the JJ-Umbo, a relic-looking electric bass with brand new electronics. [Musikmesse] Behringer TPK988 Bass Trio Aimed at bass players, the TPK988 BASS TRIO features the BOD400 Bass Overdrive for tube-like distortion and fat tone, the BLE100 Bass Limiter Enhancer, and the BCH100 Bass Chorus pedals. Two patch cables and a 10’ instrument cable are provided in the pack.